Mr Burdon – Patron of the New Zealand China Friendship Society Incorporated – has had a distinguished career across the fields of law, business and politics. A Canterbury University law graduate, he moved into the private sector in 1970 establishing a successful food-processing company and is a leading member of the New Zealand business community, holding positions on the boards of several New Zealand and Australian corporates. His political career began as the centre-right National Party member for his local electorate in 1981. Appointed to the New Zealand Cabinet in 1990, he held a number of portfolios including Minister of Commerce, Minister for State-Owned Enterprises and Minister for Trade Negotiations, until retiring from politics in 1996. Highlights of his ministerial service include leading New Zealand’s successful negotiations through the various stages of the GATT Uruguay Round and helping build New Zealand’s relationships with Asian trade partners. He represented New Zealand as Trade Minister at important milestones in the development of APEC: the first meeting of APEC economic Leaders on Blake Island in 1993; the Bogor Declaration of 1994; the Osaka Action Agenda of 1995; and the Manila Action Plan for APEC adopted in 1996. 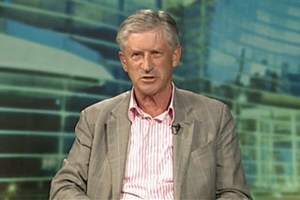 Mr Burdon has pursued his interest in New Zealand’s relationship with the Asia-Pacific region as Chairman of the Asia 2000 Foundation of New Zealand (now Asia New Zealand Foundation – Asia:NZ) (1996-01), Chair of the APEC Business Advisory Council (1999) and member of the International Advisory Board for Hong Kong Policy Research Institute, prior to returning as Chairman of Asia:NZ.